Snelgrove (2008). Society, Education, and War: John Dewey and his student Randolph Bourne. One of the persistent questions I have run into regarding the suitability of a progressivist ideology to education in the present day has been that of its radicalism. Naturally, as I addressed in my last entry regarding the reading from Waks (2013), it is not sufficient to simply recycle the progressivism of the early 20th century, to re-brand it and plunk it down in present-day schools. The radical work that John Dewey and others were doing a century ago would not even hold up as progressivism in education today, let alone radical progressivism. And luckily, Dewey and the other scholars and practitioners of progressivism in education were prescient enough to realize that. In other words, progressivism can never be an end in itself, but only a means to some other educational end. Still, this instrumentalism (Sidney Hook’s coinage for the philosophy behind progressivism in education) is insufficient as well. In a future blog entry I shall take a closer look at a specific critique of instrumentalism. But today I want to look at a couple of ways that I think progressivism ought to be updated in order to remain a useful set of ideas in the 21st century. I like to think of this updating as a radicalization—progress for progressivism, if you will. And my entry point this time will be the history of John Dewey’s relationship with one of his students, Randolph Bourne. David Snelgrove, of the University of Central Oklahoma, in his 2008 article, “Society, Education and War” gives a detailed look at the relationship between John Dewey and his one-time student at Columbia University, Randolph Bourne. As Snelgrove notes in the first sentence of his article, Bourne took a different position on the United States entry into World War I than his professor. Bourne’s position was a pacifist position. And though his relationship with his beloved teacher became fraught with conflict, Dewey ultimately admitted that Bourne had been right. Yet, tragically, Bourne died during the influenza epidemic shortly after the War and was never able to make amends with Dewey, who he apparently retained the utmost respect for despite their differing politics. Bourne’s relationship with Dewey has all the makings of a great Hollywood screenplay. Bourne, who was deformed from birth due to misuse of a forceps, was a precocious genius, and wrote brilliantly and prolifically throughout his tragically short life. Only after failing to receive financial aid to Yale and struggling for half a decade in New York City was he admitted to Columbia (on a full scholarship), where he had at least one class with Dewey, who became his mentor. 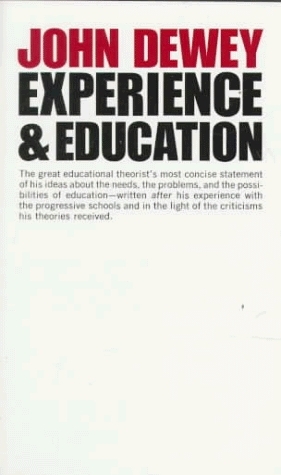 Bourne was well known in New York activist circles, and at first he uniformly praised pragmatism—the philosophical underpinnings of progressivism in education. But more than Dewey, I think Bourne understood the dangers of allowing pragmatism (and thus progressivism) to harden into a useless system of dogmas. So, even when Dewey came out in favor of War, Bourne knew that the right thing to do and what pragmatist and progressivist ideology demanded of him was NOT that he fall in line behind his mentor, but challenge what he saw as a flawed line of thought. And challenge it he did. In a series of essays collected as The Radical Will Bourne argued that Dewey’s argument for entry into WWI so as to position the United States to be able to set the terms of the peace, was pragmatism in its weakest form—pragmatism as a mere instrument. In his essay, “Twilight of Idols,” Bourne questioned, “How could the pragmatist mind accept war without more violent protest?” (qtd. in Snelgrove, p.155). And as I mentioned above, even Dewey ultimately admitted that Bourne was right. But I want to argue briefly here, that Dewey’s mistake was not simply a mistake of mere instrumentalism. His judgement was clearly clouded by his latent Nationalism—or Americanism as he more likely would have understood it. Snelgrove’s article, brilliantly dissects a series of lectures Dewey delivered on the eve of the United States entry into World War I at the University of North Carolina in Chapel Hill. This series of lectures is collected in Dewey’s middle works as “German Philosophy and Politics.” And it is an interesting piece of writing indeed. I have downloaded it, and plan to read it soon, as it looks like it may shed some light on Dewey’s eschewal of Marxism along with German idealism in general, especially as that idealism related to German nationalism as Dewey saw it. But rather than rejecting nationalism overall as one of the destructive, evil forces driving Europe and the U.S. into war, Dewey, as Snelgrove describes it, retreats to a competing nationalism. Dewey imagined that America as a nation, with its mythos of rationality and liberty would somehow be able to induce the other nations of Europe to create a more just peace. But in fact, this was not the case, and as history showed, the First World War quickly gave way to the rise of Fascism and World War II. It is baffling to me how Dewey was able to put so much stock in Americanism above all other nations. This commitment to America’s exceptionality among other nations, is a deep flaw in Dewey’s thought which comes out even in his discussion of the philosophy of education. As Snelgrove notes, the bulk of Dewey’s longer tracts on the philosophy of education were published around the time of the First World War. So, it is not a stretch to say that for Dewey “democracy and education” really meant “American democracy and education.” It is difficult to express my disappointment at Dewey’s persistent mistake thus. Why was such a well-travelled guy so tied to the superiority of the nation of his birth? Why wasn’t the arbitrariness of Americanism more obvious? Perhaps for Dewey it became so after 1945. But by that time, I’m afraid that the damage to progressivism had been done, and the onset of the Cold War ensured that pragmatism and progressivism in education could have no place in a world politics based on the fear of a nuclear catastrophe. It is easy to see in the 21st century that Americanism was never a good idea. Thankfully the Cold War has passed; but it has been replaced by a sort of global police surveillance state. The good news is that since the evils of Americanism are all the more evident now, it should be easier than ever for teachers to detach their progressivism from the nationalism which has distorted it for nearly a century. And so hopefully, in the spirit of Randolph Bourne, we can continue to struggle against such broken dogmas as nationalism and further radicalize progressivism in education. A reading of Hawkes, G. & Hawkes, E. (2013). This blog entry doesn’t really fit neatly into the weekly scheme I worked out for this course in the syllabus. But so it goes. Glenn and Elijah Hawke’s interesting “article” doesn’t fit neatly into the genre of analysis you normally get from a History of Education Quarterly or an Educational Studies paper. But their somewhat confessional, father-son exchange of seven lengthy letters touches on a variety of ideas I’ve had with regard to HOW and WHAT kind of work (whether teaching, research, or child rearing!) I want to do around Progressivism. I’ve linked my marked up copy of the reading above. The piece is called: “Miracle and monstrosities: John Dewey and the fate of progressive education.” And while it does provide a relatively complete narrative of John Dewey’s various contributions to the doomed progressive movement in early 20th century American education, to be honest, what interests me most about the piece is its form. First, I’ll do a quick exposition of what the article is. Elijah Hawkes is a middle school teacher, raised in a white, socially conscious, upper-middle-class New England household in the 1970s and ‘80s. His Father, Glenn was a teacher too, and a political activist. Both men are also interested in the various iterations that so-called progressivism in education has had in American schools in the last century. The letters that comprise the piece begin on a melancholic note: Glenn has just had a major surgery. And in an effort to connect with his father, and perhaps to distract him during a lengthy convalescence, Elijah initiates an email thread ostensibly to get to the bottom of an academic question: Why does the elder Hawkes always talk about the progressive movement in education as a failure? Presumably the younger Hawkes has reason to disagree with his father’s persistent characterization of progressivism in education (or “progressive education,” as they refer to it). And this inter-generational tension goes to the core of what I like about how this piece frames its conversation about the movement. First, it’s a literal dialogue between father and son. This is unusual in academic writing to say the least; though perhaps it is less so in the journal, Schools: Studies in Education. In their correspondence, father and son are not particularly self-conscious about this idiosyncrasy. But it gives the piece an authentic, un-edited feel, which resonates nicely with certain aesthetic considerations underlying progressivism in education—especially John Dewey’s conception of “organic experience.” At times these letters achieve a kind of rational stream of consciousness—motivated by certain political and philosophical aims. Especially the younger Hawkes is actively engaged in a dual quest for learning from his father’s experience and his own desire that the story of progressivism in education continue to be told and told better. I can certainly identify with this latter aim. It’s encouraging to see other teachers struggling with the idea of progressivism in education, especially when that struggle leads to deeper historical digging. The elder Hawkes draws on a few lesser-known titles in Dewey’s oeuvre—books I haven’t read yet—one written in the wake of the signing of the Treaty of Versailles aptly titled Reconstruction in Philosophy (1920) and a couple of later works, Individualism Old and New (1930) and A Common Faith (1934). Hawkes also unearths Dewey’s 1952 New York Times obituary, which is a document I had not considered consulting before. But aside from pointing to these primary documents, there is not a whole lot of new content to this 40-page piece. The opening question, about the elder Hawkes characterization of progressivism as a failure in education is ultimately, though vaguely overturned. And the letters finish on an optimistic note that the authors argue is more fitting to the mood of a movement that lives on—if just below the surface, often obscured, misunderstood or ignored—in American education institutions. In other words, progressivism in education has not been a failure, but the stories we have been told about it so far will not suffice. When studies of progressivism in education focus on individual activists—like John Dewey for instance— as case studies in and representatives of the whole, the complexity of the movement is elided. Myth tends to seep in to the historical narrative and it becomes tempting, and perhaps sometimes more expedient to certain ends to treat the whole affair as a blanket success or failure. This is the sort of newspaper headline version of history. “Dr. John Dewey Dead at 92: Philosopher a Noted Liberal.” But a history constructed only from newspaper headlines is always incomplete. The history of progressivism in education also needs to include voices like the Hawkes’ and all the otherwise anonymous teachers, learners, workers, activists, artists. Furthermore, these letters demonstrate one unusual new (old) way that the history of progressivism in education might be written: as a dialogue, socially constructed, against a backdrop of political struggle, and ultimately with optimism about human beings’ capacity to understand and work towards social justice. These basic ideas and impulses would have been more than familiar to a John Dewey or a Jane Addams or a W.E.B. Du Bois or a Charles Beard at the turn of the 20th century. That we are still mulling it all over a hundred years later in our emails and blogs and theses and graduating papers is evidence, if not of success, then certainly of the existence of the proper conditions for continued experimentation and *gasp! * progress in the way the education system in the United States is organized. These letters illustrate that the possibilities for progressivism in education have not yet been exhausted. Teachers in the 21st century still have a lot to learn from Dewey and Glenn Hawkes and all of our philosophical and pedagogical forebears. Next time I’ll be getting into more of the nitty-gritty of pragmatist metaphysics a la Sidney Hook. The belief that all genuine education comes about through experience does not mean that all experiences are genuinely or equally educative (p.28). By what authority do we know if we’ve had an educative experience or not? Is this part of the role of the teacher? Is it necessary to be aware of our our experiences as educative or not (i.e. through meta-cognition)? Just because traditional education was a matter of routine in which the plans and programs were handed down from the past, it does not follow that progressive education is a matter of planless improvisation (p.29). How did Dewey’s conception of the necessity of educational philosophy work against his view of traditional education? What does it mean that Dewey’s conception of educational philosophy ran so thoroughly against his conception of traditional education? Was traditional education for Dewey an “un-philosophical?” Howso? I admit gladly that the new [progressive] education is simpler in principle than the old… while there is very much which is artificial in the old selection and arrangement of subjects and methods, and artificiality always leads to unnecessary complexity. But the easy and the simple are not identical. To discover what is really simple and to act upon the discovery is an exceedingly difficult task. After the artificial and complex is once institutionally established and ingrained in custom and routine, it is easier to walk in the paths that have been beaten than it is, after taking a new point of view, to work out what is practically involved in the new point of view. . . [yadda yadda Ptolemaic & Copernican Astronomy] (p. 30).